I love almond joys. The Sister loves almond joys. So, when I called her and said, “I have a homemade almond joy recipe and you need to come over so we can make it.” She came to the house all ready to make them. The real story here is not that we made almond joys. Nope, the story is that we almost caught my house on fire while making the almond joys! Fun times. Where to start?? Ummmm, how about the beginning….. The almond joy recipe I found calls for semisweet chocolate chips. Well, because I am a lover of almond joys, I KNEW that they were in fact, made with milk chocolate. So, when I was at the store buying what we needed, I bought milk chocolate chips and NOT semisweet chocolate. No harm, no foul. So I thought. Fast forward a day or two and The Sister and I are in my kitchen making almond joys. We toasted the almonds. We mixed sweetened condensed milk with coconut and powdered sugar. We shaped the gooey goodness (while licking our fingers from time to time) and placed the almonds on top. All was going great. So great in fact, that I got a little greedy. I spoke up and said that I thought maybe, just maybe, we should not share these little gems with anyone. After all, we were the ones slaving away in the kitchen. Maybe we should just keep these to ourselves. The Sister agreed. I think this might have been the start of the dreadful downfall. The time came to melt the milk chocolate chips. We put some water in a pot and began to boil it. Then we placed the yummy milk chocolate chips in a glass bowl and put it on top of the boiling water. The chocolate began to melt and so things were still going well. However, after a few minutes, we realized the chocolate was not melting as well as we needed. Nope, this stuff was staying pretty thick. It was not drippy, but was more the consistency of icing. No worries. The Sister cranked up the heat and added a little vegetable oil. Horray, things were looking good again! After a while, I thought that maybe our water supply under the chocolate was getting low and this would also be contributing to the chocolate not melting as well as it should. We lifted up the glass bowl and discovered that ALL the water was gone! And judging by the looks of the pot, it had been gone a while. Opps! The Sister quickly turned off the heat, but I decided that just was not good enough. So, I grabbed a couple of pot holders and removed the burning hot pot and placed it on another pot holder that was on the counter. I looked over at The Sister for some reason and when I turned back to the pot, it was engulfed in smoke! Smoke so thick I honestly could not see the cabinet right behind it! It was at this moment I proved that I am not so good in emergency smoke and fire related situations. I picked up the burning pot and began to utter not so nice words as I watched the hot pad slowly fall from the bottom of the pot. The Sister however was MUCH better and was able to pull the burning pot holder off the pot. However, some of the pot holder was still melted onto the pot. And at this point we realized the parts of the holder still stuck to the pot were on fire! Again, I am just standing there saying not nice words and not really taking any action. Nice Amanda. Real nice. Smart Sister says, “let’s get that outside! !” She ran to the back door to open it and I came along with the pot. She opened the door to the patio and I managed to almost hit her in the face with the burning pot on the way out. Even better, Amanda! Sorry, dear Sister. Love you and love your face the way it is. 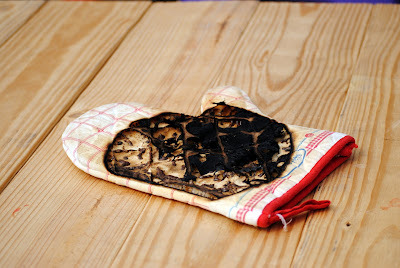 So glad I did not burn you! Once outside we put the pot on the cement patio and things seemed to be better for us. We started to laugh a little. Geez, if he realized that we just saved the house from burning down, he would really not be so irrational about the smell in the house. He then emerged from the house with the burning pot holder that we left in the kitchen! Opps again! Or maybe we could just not burn things at all. That would get my vote. I stomped all over the pot holder until it went out. The Sister and I laughed some more. Our breathing returned to normal. We returned to the kitchen and finished making the almond joys. 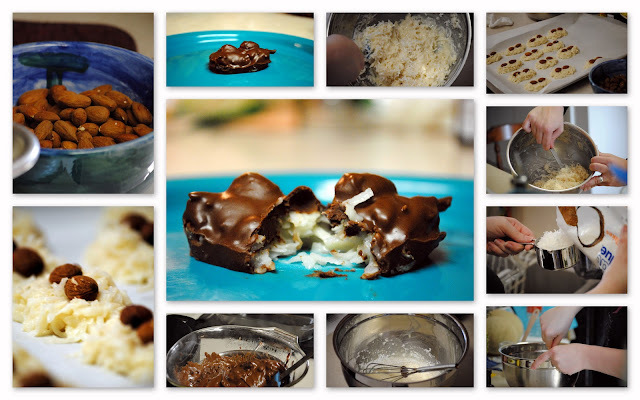 Here are the pictures of us making the almond joys. One would never know the back story of a near house fire by looking at them. It looks as if all went okay and we made these lovely and gooey treats without incident. However, please do not be fooled. Things do not always run smoothly at my house and this picture proves it! By the way, the almond joys were delish. However, The Sister and I decided that we would make them again and use the semisweet chocolate chips.